You ever look at Fluffy or Rex, happily chomping away at whatever's in their bowl for the 3000th time, and wonder how a creature can so happily eat the same thing over and over again? Or, even better, think it'd be so great to just be able to buy a 20-lb sack of chow for like $10 like you do for the dog, and just have that be your food for a month? You think, hey, it works for them, something like that should be able to work for me. Then you remember, yes, there was once upon a time that you could do that, but college has forever ruined you on ramen noodles, so you just can't do that again. Me? I think about that stuff often. I sure know my bank account appreciates the sentiment. Then it laughs because it hurts too much to cry. 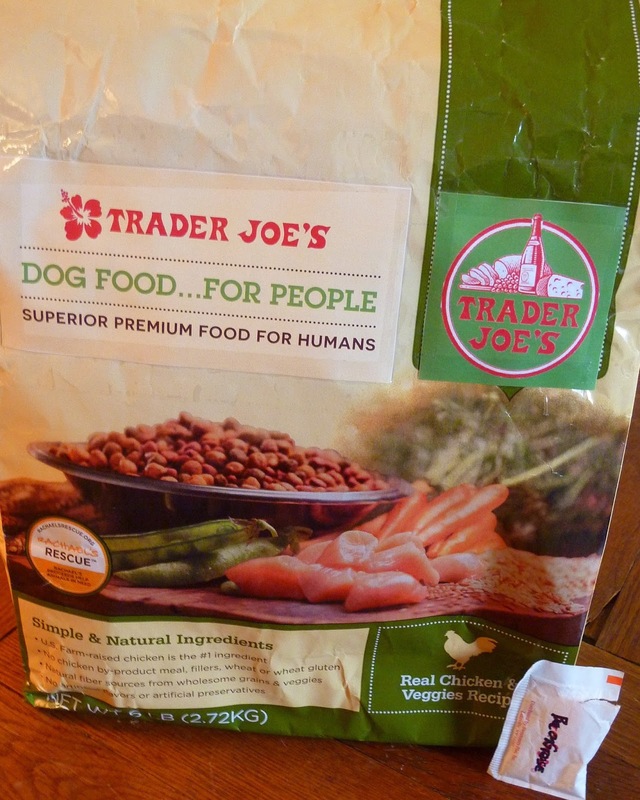 Much like the cats cookies for people, Trader Joe's Dog Food...For People is an animal-esque product clearly meant for human consumption. 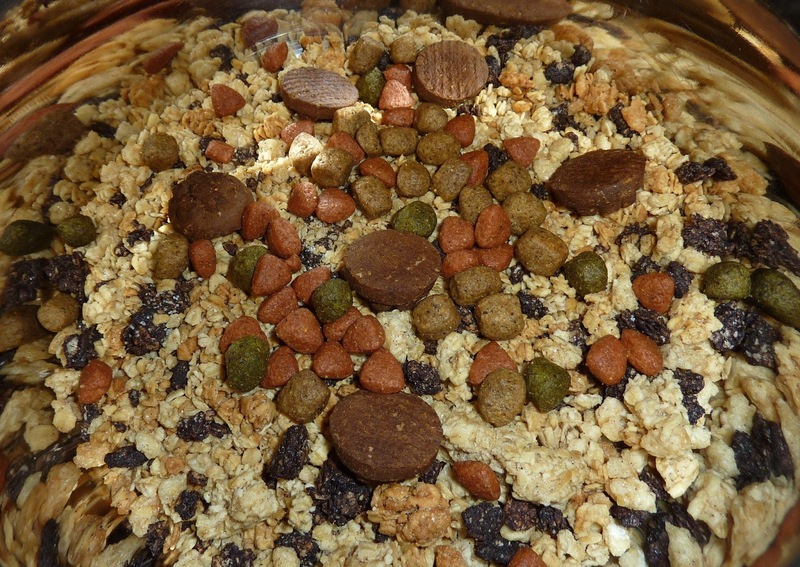 Don't get them confused - though Fido probably won't mind, actual dog food tastes too much like a nasty Triscuit for most people to enjoy, which Russ learned firsthand thanks to his seventh-grade science teacher. The concept itself is so straightforward yet so brilliant - it's just a sack of food pellets designed for human consumption, brimming with all sorts of nutrients and hey, some flavor, too, that makes a good, sustainable food source that's worthy of everyday eating. Wait, you say. How can someone be happy eating the same thing every day? Doesn't that get old? At least ramen has different colored salt packages, right? As usual, Big Joe's a step ahead. From what we've been told, there are a few varieties in the works. The one we got to sample was chicken, quinoa, apples, and Brussel sprouts, with a maple-y finish. Granted, it didn't really look like any of that, because it was just dark brown and tan crunchy pellets...but it's all there. Every bit. And to help change things up every so often, there's little "additional flavor" packets on the side to mix in - like hot sauce, bacon grease, cheddar - it's all in powdered form, but if you can overcome that, it's incredibly satiating. If that's not enough variety, there's vegan as well as seasonal varieties in the works (Thanksgiving: turkey, cranberries, sweet potatoes, gravy, pecan pie, and TUMS, for example). Just like real pet food, it comes in a 20 pound bag, so it lasts a while. Savor it in. But...this is where it gets little weird. Might be a deal breaker for some, but trust us, it helps, we're experts. Historians have recently discovered that our primitive ancestors may have eaten on all fours before the invention of the table. They saw the animals around them doing it, so they simply copied what they saw wolves and bears doing and ate off the floor of their caves. Eating in this posture may have increased the metabolism and aided digestion. Similar to the popular "caveman diet," TJ's has latched on to this idea and thus formulated this product to be consumed like a dog or a primitive human. Nathan was kind enough to make an instructional video to demonstrate the suggested eating technique for the Trader Joe's Dog Food...For People. It's strictly educational, of course. In all, this is a legitimate game-changer. 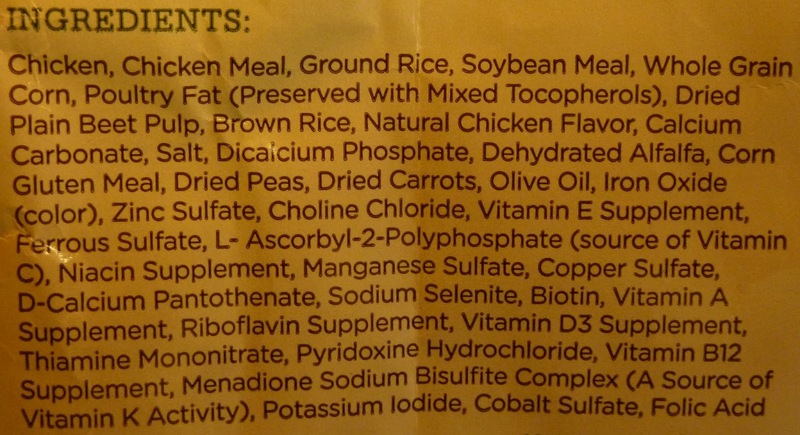 I (Russ) have eaten nothing except this for about three or four days straight, and not only have been happy and felt great, but I've noticed some pleasant, well, not "side effects" but perhaps "unexpected bonuses." First, I'm sleeping better, in nearly any position. My senses of smell and hearing have greatly improved, and my "fur coat" (for lack of better term) has been become fuller and stronger, which was wonderful for dealing with the last of the wintry throes. I'm also feeling a lot happier, especially when seeing fire hydrants, although my wife and boss say I seem more distrac-SQUIRREL!!! !...Um, where was I? A twenty pound bag costs only $11.99 and lasts for a few weeks, depending on how many cups I eat a day. The side panel says for an active male about my size I should eat three or four servings daily, which seems right. Really, just this, some water, and whatever scraps my toddler sneaks me are all I need. That and a little scratch behind my ears from time to time, and for that mailman to stop coming around. If there's one chow that can make my tail wag, this would be it. You really had me until I started watching the video. I actually agree it would be a worthwhile product as much as I love food there are days where I wish I didn't have to think about it at all! This has got to be an April Fools joke, right???? Dogs love Dog Food...For People, people love Dog Food...For People. You had me until you recommended eating on all fours :) Nicely done. I fell for it until all fours as well! I'm ashamed of myself for falling for this! Didn't kick in until the last paragraph!! Reading it two days after April Fool's really helped with the deception! Before I caught on I was ready to post the following as a comment: "why? just WHY? and don't tell me your wives approved of this." LOL! Royal Canin is an excellent product. This food focus totally on the animal, with the aim of improving daily life and ensuring better health for dogs through nutrition. Right, but can people eat it? Royal Canin is an AWFUL food; especially for the price. If you're going to be paying $2/1lb for dog food, please buy something that doesn't have the nutritional quality of Dog Chow. Merrick, Orijen, Solid Gold, Back to Basics, Innova, etc... Royal Canin is about as healthy as a bag that's 20lb for $10. Granted, I don't believe RC has had lead in it like some of those other grocery store brands, but it's still not a good food. I didn't see the date on this post, so you had me up until eating on your hands and knees. Woe is me. I'm ashamed to be so gullible! Glad we fooled you for a while, Lindsay. Thanks for the advice about dog food! Ahahaha! That is so funny. hah. since its PI day (march 14, 2017), I legitimately thought this was a real thing. Doesn't help after catching a bobs burgers episode where they were all eating Cat food.